Who is . 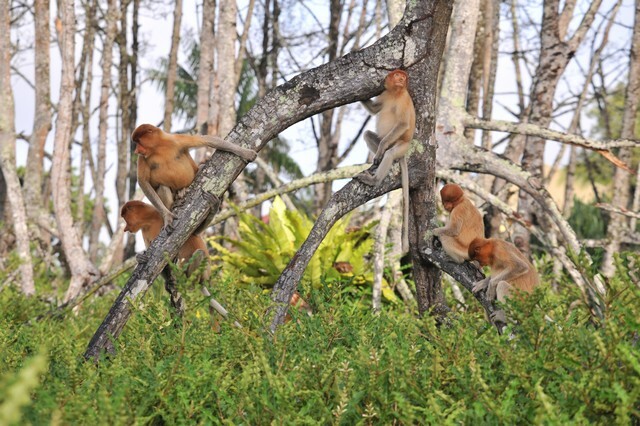 . .
Proboscis Monkeys (Nasalis Larvatus) are endemic to Brunei (and Borneo) as lions are to Africa. There is no sub-species for this family of monkey and the Borneo proboscis monkeys have been listed as endangered species under 2000 IUCN Red List. 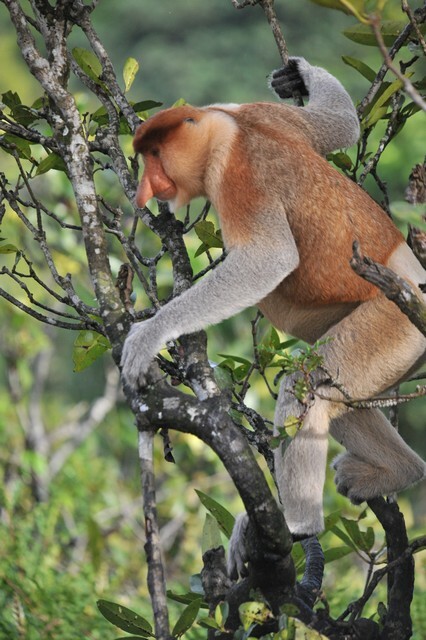 In Brunei, the proboscis monkeys are given local names “Burak” or “Bekantan”. This outing was planned more than a year ago. Commitment to work and other photographic events interrupted this excursion. Until, my guide, friend, student and business associate agreed to take me to a particular riverine mangrove forest along the Damuan River. It was his second last day in Brunei, before leaving this Abode of Peace for good to resettle in Penang, Malaysia. Rudy Gerard Chong direct messaged me on Facebook. Early the next morning, we met by the misty bank of Brunei River to catch a boat. Not any boat, but one reserved by Rudy specially for me. Rudy and the skipper had been business associates for years, having taken scores and scores of tourists on such a tour. But to day, this one was for me. I felt really honoured. Rudy did it just for me. 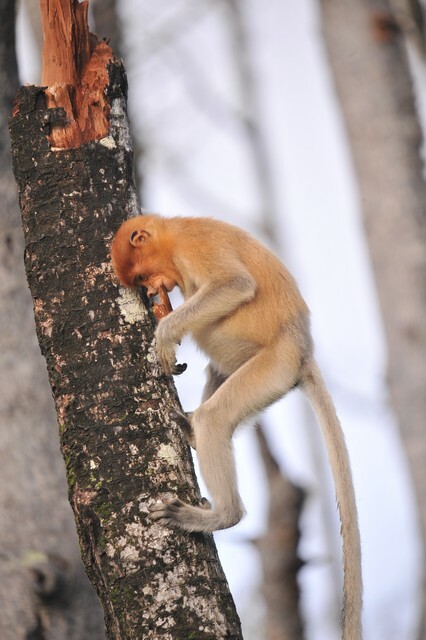 Just as Orang Utans are uniquely found across the Malay-Indonesian Archipelago, the proboscis monkeys inhabit Borneo. The long-nosed monkeys I saw are found living along riverine mangrove swamps. They live in small groups, and I was told by the boatman, these creatures are territorial. When in search for food, the group would swim across the river. The animals feed mainly on leaves, fruit and flowers. On this trip, I was privileged to capture one eating the bark of a mangrove tree. The small group of 7 monkeys I encountered had an alpha male. For this species, it is the male with the distinctive long nose, hence the proboscis monkey name. The nose on the female is not as large. On the juvenile monkey, its nose is short and upturned. In this group, the alpha male would climb to the highest limb in the trees to make sure his “harlem” was safe before he descend and move on with those under his charge. Please do leave some comments on the bottom of this page. TQ. It was not easy shooting from a wobbly boat in the river. I stood at the starboard ledge of a rocking sampan (local wooden boat), handholding the Sigma 50-500mm lens (monickered as Bigma) mounted to my trusty Nikon D3. Both heavy gear, tipping over 3 kg. In my camera bag was my other lens, the Sigma 70-200 f2.8 EX but this was of no use as the monkeys were too far to be within reach for this second lens. So it stayed cushioned and dry, cocooned in my trusty Lowepro camera bag. Just checking . . .
Who are you calling noisy? Staring at me . . . This river safari was my first attempt at immortalizing images of Brunei’s unique proboscis monkeys. I would certainly make a few more attempts to capture stock quality photos.